This rich, complex herbal after-dinner infusion from Piedmont, Italy, is cocktail-ready. Consider it a fancy cousin to luscious Italian vermouths. 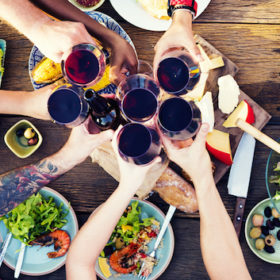 A gift of wine shouldn’t be a potluck item: It’s better to offer something a little special, maybe even a bit unfamiliar. Enter Barolo Chinato, an after-dinner treat from Piedmont, Italy, that’s also one of today’s most compelling cocktail ingredients. Barolo Chinato is perhaps best considered as the fancy cousin to luscious Italian vermouths like Carpano Antica Formula. Instead of the basic Moscato base that’s commonly used for vermouth, Barolo Chinato begins with 100% Nebbiolo—in fact, certified DOCG Barolo wine—to which a blend of herbs, spices and bittering agents, macerated in grappa or grain alcohol, is added. Some versions lean heavily on clove, ginger and cinchona, while others include juniper, cardamom, orange peel, wormwood and gentian root. The resulting vino aromatizzato are rich, full bodied, complex and compelling. Sommelier Joe Campanale, founder of Annona Wines, recommends Cappellano and Roagna for sipping straight. Most bartenders use the less-pricey Cocchi for mixed drinks. Barolo Chinato provides a bolder, more concentrated flavor than vermouth, and it contributes velvety layers of sweet fruit balanced by bitterness, floral aromatics and spice. It’s particularly at home with aged spirits like whiskey, apple brandy and reposado Tequila, but also shines in a lighter treatment. Try Campanale’s favorite: gin, soda and fresh cherries. Erik Carlson, bar manager of Bastille Café and Stoneburner in Seattle, adds Barolo Chinato to Bourbon, lemon, frothy egg white and fragrant orgeat for a robust and aromatic take on the New York Sour, a classic whiskey drink usually topped with fruity red wine. Adding Barolo Chinato to Bourbon, lemon, frothy egg white and fragrant orgeat makes for Carlson’s robust, aromatic twist on the New York Sour, a classic whiskey drink usually topped with red wine. Combine ingredients in a cocktail shaker. Shake well 10 seconds. Add ice, and shake until well chilled, about 12 seconds. Double-strain into a chilled cocktail glass. Recipe courtesy Nathaniel Smith, bartender, Spoon and Stable, Minneapolis. The Martinez is an underappreciated classic cocktail made with silky Old Tom gin, sweet vermouth, and maraschino liqueur. In this variation from Nathaniel Smith of Spoon and Stable in Minneapolis, aged tequila stands in for the gin and full-bodied, bittersweet Barolo Chinato stars in vermouth’s place. Lighting a high-quality cocktail cherry on fire at the bottom of the glass adds a toasty aroma and flavor to the drink. Combine tequila, Barolo Chinato, maraschino and orange bitters in a mixing glass. Add cherry, Everclear, and 2 dashes Maraschino to a coupe glass and ignite. Let burn, and add ice to mixing glass. Stir until well chilled, about 30 seconds. Put out fire by straining cocktail over cherry. Serve immediately. Recipe courtesy, Joe Campanale, founder, Annona Wines. While many pair Barolo Chinato with barrel-aged spirits, Campanale prefers to go light. Using the gin and tonic as inspiration, the cinchona bark in Chinato stands in for the bitterness traditionally contributed by tonic, while adding a herbal notes. Campanale recommends citrusy, floral gin, such as those from Greenhook Ginsmiths. In a wine glass or Collins glass, add the gin and Barolo Chinato. Add ice, top with soda water and stir gently. Garnish with cherries and lemon twist.